Echinaceas are one of those plants that I cannot resist taking a photo of, whether they are in bud, in full flower, gradually dying, or in their seed head stage. I photograph them in every season whatever the weather. But first a look into my sketchpad. And here is a gallery of some of my attempts. I try to capture their various shapes, colours, textures and catch their every mood. The photos were taken throughout the seasons from summer to winter and I hope illustrate their changing shapes and colours. I have at last got a link to my Flickr photostream so if you want to see what is on there so far please click on link in right margin of my posts. This entry was posted in colours, garden design, garden photography, gardening, gardens open to the public, hardy perennials, photography, winter gardens and tagged changing colours, coneflowers, echinacea, garden photography, gardening, seasons, winter gardens. Bookmark the permalink. First of all, these are lovely sketches and photos of a very special plant. 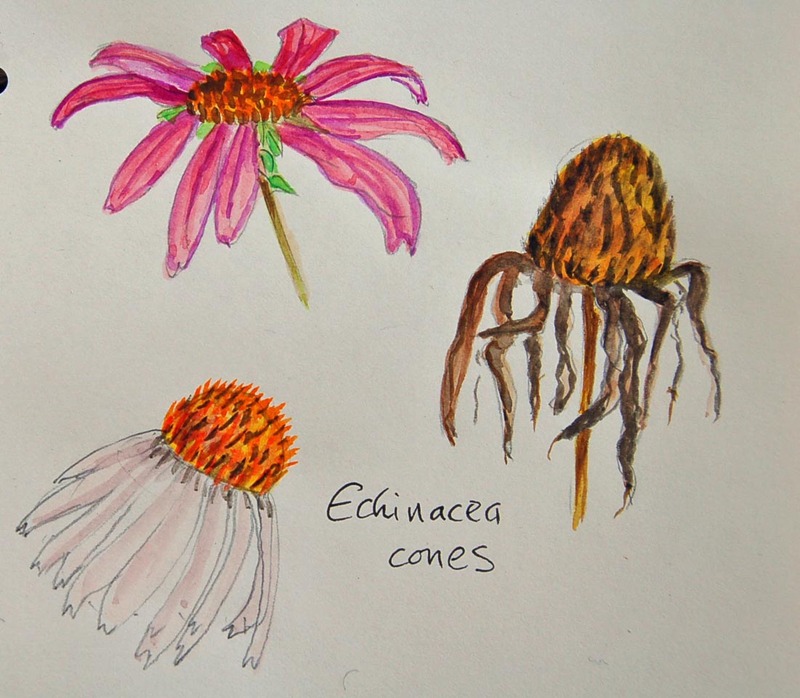 It is interesting that you have sketched an Echinacea flower dying. Some plants fade better than others and Echinacea makes beautiful seed heads. I actually like the seed heads more than the flowers! Wonderful flowers, echinacea. You’ve captured their gestures very well in your drawings. Many thanks. I enjoyed working with them! Many thanks! I am enjoying getting back into my sketching and painting again. thanks for the encouragement. Glad you enjoyed looking at my sketches and photos. Great plants – colour and stature! Many thanks for nominations – much appreciated. Love that you keep a comprehensive sketch book.. In the mould of Graham S Thomas. How did your echinceas fare with the wet though? They are not happy in the wet – far fewer flowers. They are beautiful in every stage of life! Thanks for your comment. I think lots of plants should be looked at in this way too! These are one of my favorite seasonal flowers. My goldfinches devour the seeds and flit from flowerhead to flowerhead. Thanks for reminding me of what’s to be this summer and autumn in my large circular coneflower garden. You did them justice in your descriptions and words. Many thanks for your much appreciated comments.